The lion can run around outside all he wants, but I feel just fine tucking in, hovering around the kitchen stove. It’s particularly during chilly weather that I drift toward Texas cravings and comforts—the flavors of my youth—like spicy enchiladas in mole sauce, tomato soup and grilled cheese sandwiches, and of course, a beautifully prepared steak. When I moved to Manhattan, I found many who would say, “I’m not a vegetarian, but I only eat chicken or fish, I NEVER eat beef.” This always amused me, as if eating beef was a bigger sin than say… chicken. I would also hear comments from the health-conscious, “I try not to eat red meat, but stick with chicken or fish.” As a new Northerner, it took some time to understand that their ideas were culturally infused, as were my own, and that our taste buds lean towards our upbringing. Japan has its sushi; Germany, its pork. Maine brings in the lobster; California, the avocado. Texas and Oklahoma? Beef is what’s for dinner. Yet, in my humble opinion, I believe eating meat requires respect, and that maybe all of one’s meals shouldn’t come with a side of cow… or chicken… or pig. And I also believe that a meat’s purchase and preparation should have a little more respect as well. What happened to our neighborhood butchers? Have they disappeared into legend? Actually, I have discovered I’m not the only one wants more butchers. 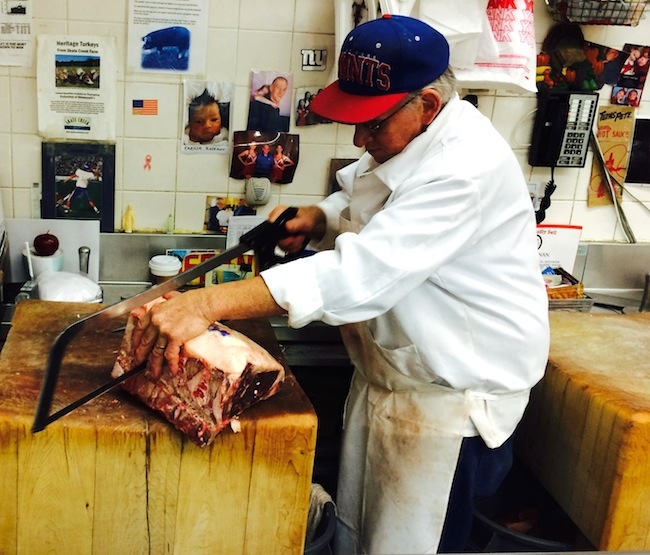 Butcher shops are growing in Manhattan, and the demand is spreading throughout the U.S. This makes sense considering the new conscientiousness that has sprung up through our recent healthful food movements. Respectful meat eaters want a little more ceremony in the buying of flesh. And what about choice and quality? Plastic-wrapped meats on the refrigerated shelves do not tell us where the meat is sourced, how it’s been slaughtered, how long the shop has had it under its roof, or how it has been carved. Nor does it tell us the methods to which the meat should be stored and prepared. Only a butcher can tell you that. 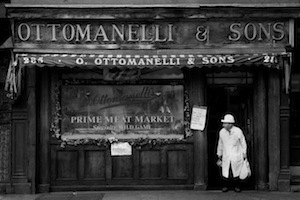 A friend of mine told me about the “Butchers on Bleecker Street.” This sounded like a crime novel, but I soon found out that Manhattan’s Ottomanelli & Sons Meat Market has been providing all the aforementioned qualities of a good butcher for over 100 years. I just had to go. There was a line when we arrived, but it was worth the wait. He asked us questions about what we liked and gave us suggestions on what would be good that day. 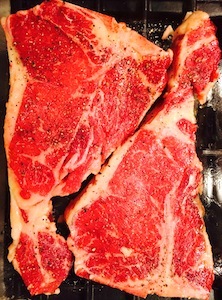 The butcher helped us with our choice and we ended up with dry-aged porterhouse steaks—two meaty giants, perfect for a meal for six. He used a knife AND a saw to prep them, taking his time, giving the meat his full respect. He didn’t rush us but looked us in the eyes and made sure we were satisfied. He also didn’t mind me taking photos. He seemed completely aware of how mythical real butchers can seem these days. They were some of the best steaks I’ve had… EVER. And that’s saying a lot from a drifting Texan like me. The dinner was marvelous. The company was full of good cheer. The hearth felt complete and purposeful. Bellies were smiling. The Lion of Winter may still prance about outside, but a little nod to what your inner child is craving will warm you in no time, and for me that’s a very nice—as big as Texas—steak. You can enjoy a good steak without a grill and without a giant kitchen. All it takes is one good heavy skillet, an oven pan that’s not too deep or too shallow, and a few spices and herbs to bring out the meats gorgeous flavor. Preheat oven to 375 degrees Fahrenheit. Coat the steaks in olive oil, dust with salt, pepper, and garlic powder. Let rest while pan heats. (If you’d like to use fresh garlic, pierce the steaks on both sides with a steak knife and insert the sliced garlic cloves in the holes.) Place an iron skillet over a high flame and to the point of near smoking hot. Place steak in pan and sear on both sides, briefly searing the edges as well by using your tongs to keep steak on its sides. If you are making only one steak, place the skillet inside the preheated oven and to finish cooking. If you need more room, transfer seared steaks into a shallow roasting pan and then place in oven. When steaks are at the preferred doneness (rare, med-rare, med, med-well, well), remove them from the oven and top each steak with one good-sized pat of butter. Let rest for 10 minutes before serving. If eating family style, cut steaks into smaller pieces before serving. 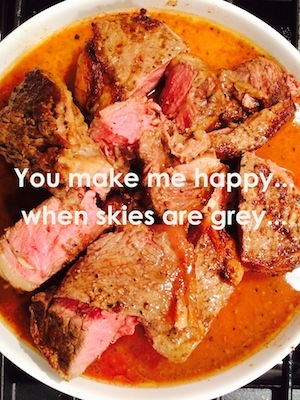 If not, place that happy steak on your plate and enjoy. Is it really that easy, Elise? Yes. Yes it is.